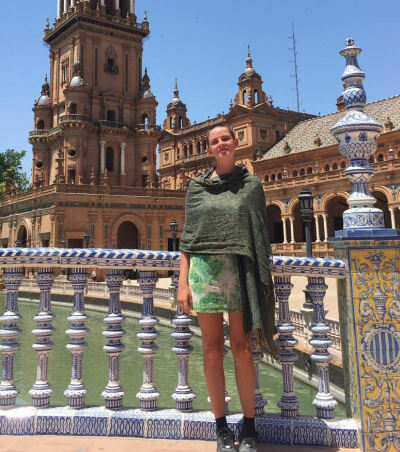 Hannah in Sevilla at the Plaza de España. I’m an 18-year-old Australian, just finishing a year abroad in Europe between high school and university. I have backpacked alone and these are some of my tips and tricks for a first-time backpacker, geared towards travelling in Europe. 1. If you want to go travelling you should. I found this year was the perfect year for travelling as I’d saved up, had money to go wherever I wanted and see things I’d only studied. I had just finished all my years of school and didn’t want to go straight into university. My year abroad has made me grow up and learn to live independently, use money well and helped me gain more understanding into what I want to do in my further studies; I even completely changed the course I wanted to study and realised that I wanted to learn another language! particularly when you are young and travelling alone, but there are many ways to begin your trip so you don’t get overwhelmed. The first month of my trip was an organised program, so I was with the same group of people and staying in the same place which really eased me into my trip. Other ideas are beginning your trip with friends to get your bearings or if you have family overseas, start by seeing them and then going off on your own. 3. There are ups and downs of travelling alone. I found that travelling on my own worked for me because I had complete control over what I wanted to do and where I wanted to go. I met so many people, travellers and locals that I wouldn’t have met if I was with a group of friends and it took me out of my comfort zone, I learnt to cook and I learnt to manage independently. There were no arguments or different viewpoints so I felt very free. The biggest downside was probably loneliness. I had times where I felt that even though I was always meeting people, I never really got to know anyone or have more than that “first” conversation. Thankfully many solo travellers were very understanding as they felt the same way sometimes. especially when going on a long trip. Everyone is different: I met someone who had just been backpacking for a year and she was loving it but I was completely burnt out after two months. That’s one reason I incorporated Workaway into my trip. Workaway is a website for volunteers that has so many amazing aspects. You can do a variety of different things such as working at hostels, on farms, with animals, nannying, etc. in a country that interests you. It is an incredible cultural exchange and you will learn about a different way of life, work skills or perhaps something you want to pursue in the future. You stay grounded for a few weeks up to a few months, and the people you work with become your friends (combatting one of the downsides I mentioned earlier) and teach you new skills. I have done two this year: one month in Croatia in the summer on a self-sustainable farm and an olive harvest in Spain. Without Workaway I don’t think I would have been able to travel for the length I did. This is something I wish I had read before I left. I was so excited in my first few months of Europe that I went from place to place every two or three days. It was completely exhausting and expensive. I would leave the hostel at 7am and not return until 10pm, trying to pack so much into my day that I ended up too tired to be amazed and astounded at what I was seeing. Rather than two or three nights in each place consider four or more nights, especially in bigger cities. This means that not only do you have more time to see anything at a slower pace, you also have time to relax, sometimes have a late night and be able to sleep all morning and connect with people properly. 6. Try not to overplan. It is difficult to believe before you leave that it’s actually really easy to travel as you go and not book far in advance (depending on the season – in the middle of summer you need to book a little further in advance whereas off-peak seasons you can book a day or two in advance). I remember going through “Europe on a shoestring,” a fantastic Lonely Planet travel guide, freaking out because everything looked so beautiful and I didn’t know where I wanted to go or how to get from place to place or what to book. My parents told me to calm down and I would quickly figure it out while travelling, and I didn’t believe it at the time but it became very easy very quickly. I knew I wanted to do an anticlockwise loop around Europe (Western and Central) and that I was flying into Madrid and that was pretty much all. When I arrived in Madrid, I did some Internet searching, talked to other travellers about what they liked close by, found a 7-hour bus to Lisbon and that became my next stop and it went from there. 6. Hostelworld and GoEuro are your best friends. Hostelworld is a really fantastic and easy to use app that you can use to book your hostels. You can read other people’s reviews, compare prices and see how close the hostels are to the center of town. Definitely read reviews and pay attention to the reviewers’ ages. In Europe I didn’t have much trouble but in Ireland I accidentally booked “homeless” hostels because I just booked the cheapest place rather than backpacker-friendly places. It is ALWAYS better to spend more money to be somewhere you feel safe and comfortable as if you don’t feel safe at your hostel, it really affects how you feel about the city or town you’re in. It’s also good to pay attention to different things the hostel offers: it could be a free breakfast, kitchen, a bar, right in the center or even a pool. Also treat yourself occasionally: go for a private room in a hostel or Airbnb (in Bosnia a private room and ensuite in a hostel was 18 euros) as sometimes you need some alone time and a good sleep after sharing a hostel room with 6 or more people for a month to get your spark back. GoEuro is a fantastic site to compare bus/train/flights to your next place. I generally used buses to get from place to place as it’s far cheaper, more comfortable and safer (I’ve heard some stories of things getting stolen on trains), also lots of buses have Internet, including Flixbus which was my favourite way to travel and has many connections and very, very cheap fares. SkyScanner is great for cheap flights (Ryanair is fantastic for budget flights, it cost me 20 euros to get from England to Ireland!). I looked into both of these before I went and decided they weren’t right for me. Interrail seems good for groups and smaller trips but it’s very expensive and both restrict your trip to certain destinations and I found it was just as easy to book buses as I went and I didn’t miss smaller towns that other travellers told me about along the way that I might not have been able to see otherwise. Busabout has many perks: they take you to lots of destinations and right to the front of hostels, good for solo and first-time travellers because you meet lots of people on the bus (mostly Australians apparently!) but it seems cheaper and in many ways easier to just travel as you go. I can’t say much more than that because I didn’t use either but I think it definitely depends on the individual person and it’s good to look into it. I think I must have searched through so many sites about this and again it’s very much up to the individual. I can tell you that my budget was 50 euros a day and that was plenty. I mostly spent less unless I had a big night or a flight but it mostly evened out in the end to 50 euros. My budget meant I could stay in good hostels, go out for a meal once every couple of days, see all of the tourist attractions that cost money that I wanted to see and treat myself to delicious gelatos in Italy or a pint (or five) in a pub. At the start of my trip I was very tight with money but relaxed as I went. It’s always a good idea to find the places you want to go to in advance as most museums and galleries have certain times when they are free or reduced (IE the Prado in Madrid is generally free between 6-8pm) and many tourist attractions are reduced if you are a student and have a student ID or something showing you are a student (I had an email saying I had been accepted by my university). Time versus money is also something to bear in mind. I walked everywhere at the beginning of my trip which is a great way to see more of a city but also means you might run out of time to see all the things you really want to see! Public transport is generally very easy and super cheap, and if you search on Google maps from your current location to where you want to go, it will tell you the best route to use. 9. Food. Go out as much as your budget allows! The food from each country is as much a part of your travelling as the attractions or people. Talk to other travellers and ask hostel staff to recommend their favourite restaurants. Do a quick Google search to see what the food specialities are in the city, country or region where you are. Go out of your comfort zone: try spiders in Cambodia and snails in Portugal – you might be surprised! It’s very easy to spend a minimal amount on food when you’re not eating out so you can treat yourself, and if you avoid tourist hotspots you can find cheap restaurants with delicious, authentic meals. When eating in, I found going on a big supermarket shop when I arrived in a new place the best way to go. Make sure you buy a variety of foods to keep you healthy and energised. I generally bought a cheap tub of yogurt and muesli for breakfast (if the hostel didn’t provide one), a baguette with some ham or cheese and veg for a packed lunch before I went out and then had simple meals to cook in the evening such as baked beans and potatoes, easy Mexican wraps, ingredients for pasta sauce, lentils. As long as you get some proteins, carbs, fruit and veg you’ll be alright (if you just live off pasta and rice, you’ll very quickly become tired and grumpy) and making something to go with them is really easy. Definitely try and find hostels with kitchens. Also I always forgot about sugar! It sounds weird but a gelato (delicious and only 1-2 euros) or something similar can really boost your body when you’re feeling a bit tired and sore. The smaller the better. My backpack was approximately 10kg. I could take it on the plane with me and I haven’t even worn all the things in it. I also had a smaller day bag for a book, journal, water bottle (really important! go for a light, metal bottle that is at least 500ml so you stay hydrated especially in the heat – there are lots of places to fill up water and you sometimes have to pay for water in restaurants in Europe), wallet, phone, charger and a packed lunch. I’ve seen people with all sorts of unnecessary things, huge amounts of makeup, hairdryers and straighteners, big wheely bags which seemed to make travelling a lot more difficult (they’re fine for small trips but after a few months you will wish you hadn’t packed everything, especially as they might break or get stolen). A backpack/rucksack is the most efficient thing to have as it’s easy to carry around (remember those cobbled streets!) and easy to access and put in lockers in hostels. I also found dry bags or storing cubes are lifesavers so you can easily find different items of clothing without taking all your clothes out. A lock is really important as most hostels provide a locker but only some have locks and if you don’t want to carry your passport and valuables around with you then you can keep them safe at the hostel. Pack multiple bank cards and store them in different places (and some emergency money) so if one gets stolen you have access to money. Always know where your things are and keep your eyes on them (even when you go to the toilet!) because people do steal other people’s things and many people I’ve talked to have had things stolen from them. There are You can pack certain things which will Various things can You can pack certain things to help you save space: LUSH sells shampoo/conditioner bars which wash your hair well and are very compact and small and not liquid, a travel towel is very compact, plastic or dry bags for dirty clothes. Try not to pack special clothes/items because it’s very easy to leave them behind but pack lots of knickers and socks. A good way to save money on washing clothes is to wash knickers and socks in the sink with soap when they get dirty and just do a big wash when all of your clothes need it (check prices as some hostels are a ripoff for clothes washing compared to a laundromat). I’m sure I could keep going on about different things to help you travel but you will find most of them out along the way and that’s one of the best things about travelling! You learn so much and do so many things from seeing Picasso’s Guernica in Spain to hiking the High Tatras Mountains in Slovakia. You will meet amazing and like-minded people and experience different cultures and traditions. Things will definitely go wrong: I had all my valuables stolen in Cambodia, missed buses, had the weirdest of people in my hostel rooms, gotten bedbugs, been lost in a city with no phone and nowhere to sleep, you name it but you will learn from them and try not to freak out because you will be able to figure it out and from it you will learn how to deal with similar situations in the future. My parents call it “character building”. I promise you’ll laugh about it when it’s all over. My year of travelling has been the most incredible experience of my life and I definitely now have the travel bug. Seeing the world is one of the best things you can do and I would recommend it to anyone of any age. This article was written by Hannah Robinson from Melbourne Australia when a snowstorm stopped the olive harvest in the south of Spain on the 11th December just before the end of the trip which will end with a family reunion in Australia.